WE thought people only listen when E.F. Hutton speaks. Not true! Looks like Janet Yellen, the new Fed Chair can move markets too. According to the Washington Post yesterday, her optimistic assessment of the nation’s economic prospects, despite recent poor job growth, rallied the stock market. 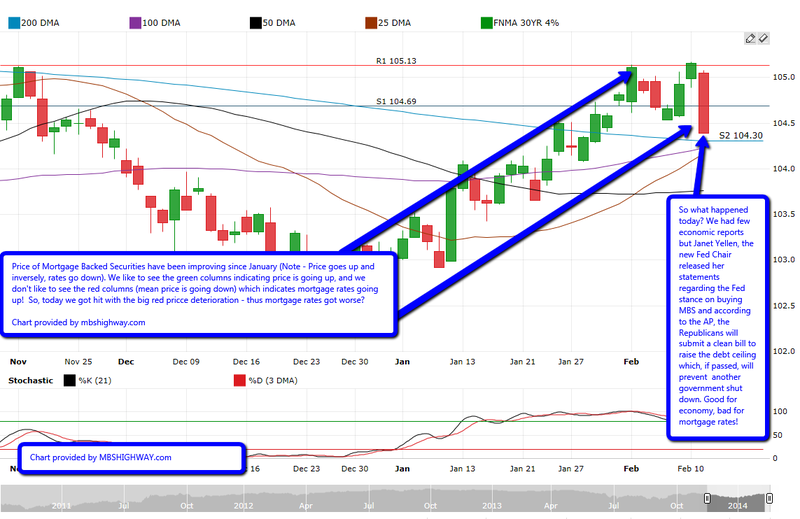 And thus, pulled money from treasuries and mortgage backed securities (MBS) causing rates to go up a bit. We will stay tuned! The information contained in this training has been prepared and distributed for educational purposes only. This training information shall not be construed as a guarantee of loan approval; All loans are subject to underwriter approval. The market has opened this morning right where it left off last week. It continues to deteriorate. But, first let’s recap what happened last week. 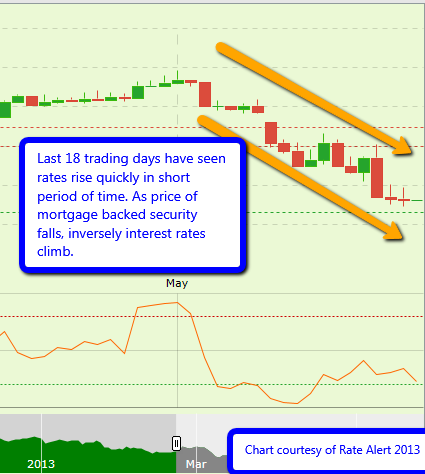 Looking at the graph to your right, the last 5 out of 6 trading days got worse for mortgage rates – note the “red escalator” on the far right of the chart. In addition, last week wasn’t kind to stock market investors as well. 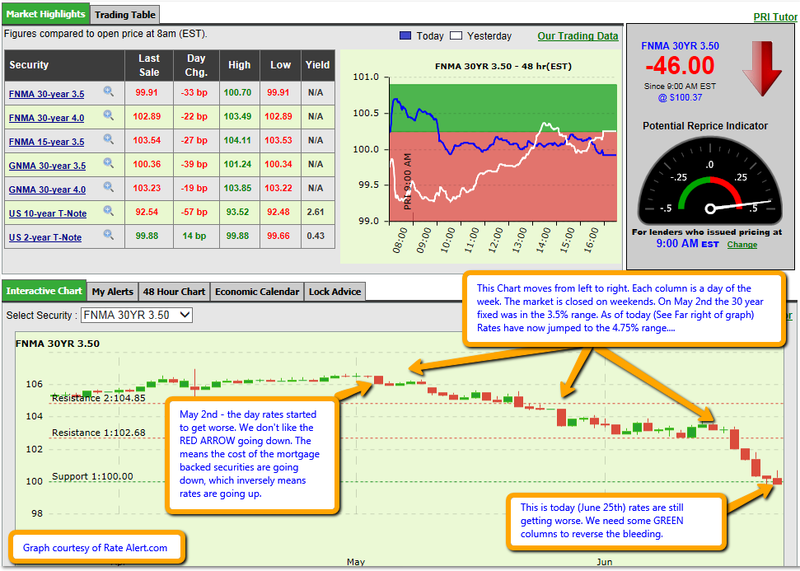 The unrelenting selling in the MBS markets has gotten a bit out of hand, and has a panicked feel. 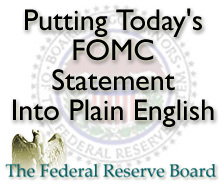 This may have something to do with the Fed, who suggests that the present quantitative easing (QE) program may be modified in the near future. This is not a surprise as Fed chairman Ben Bernanke said, at some point the Fed would begin exiting, likely inch by inch but obviously not in one fell swoop as the market decline over past few weeks seems to imply (see chart). According to the Federal Reserve’s quarterly Senior Loan Officer Survey, it’s getting easier to get approved for a home loan. 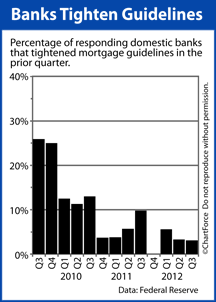 Between July – September 2012, fewer than 6% of banks tightened mortgage guidelines — the fourth straight quarter that’s happened– and roughly 10% of banks actually loosened them.